Affordable Haircuts in Marin? Yes. *UPDATE* 11/23/10 this place is now called Salon Mirsa but it’s still the same great people. I got a haircut in the Bay Area for $10! In today’s economy I’m always looking for a good deal. As you might have guessed I spend a big chunk of my income on going out to eat which leaves me to budget the rest of my finances. I’m very careful about how I spend my money and I don’t spend more than I have. In order to have enough money to enjoy all the wonderful restaurants I like to patronize I have to keep my budget in check. A great way I found to save a little extra cash is on my haircuts. I like to support local independent business so going to that big chain haircut store to get a mediocre haircut doesn’t really fit with my plan. But going to a local independently owned salon and paying $70+ for a haircut doesn’t really fit with my budget. I was thrilled to discover Salon Carlos located in San Rafael in the Canal district. I can get a good quality haircut for only $10! Actually, Celia discovered this place when she worked at the Canal Alliance. It is located right next door. 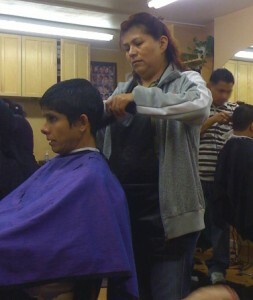 We both go to Salon Carlos regularly to get our hair cut. Celia even went there in November to get her hair dyed purple. Since she keeps her hair so short the purple has already grown out and she is back to her usual salt & pepper look. 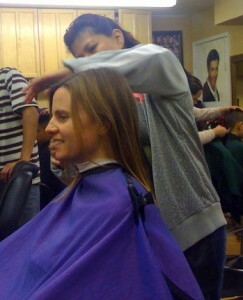 Our favorite stylist is Tere; she always does a great job. However, on days when she is not there I’ve tried others and they are also very good. While waiting for Celia to get her hair cut I’ve watched Carlo’s cut hair, he’s great with the small children. If you are looking for a good, inexpensive hair cut and want to support your local business owners then I highly recommend Salon Carlos. You may want to call first to get an appointment because it is always full of people. 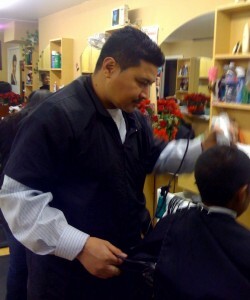 Salon Carlos is open Monday through Saturday from 10am – 8pm and Sunday from 9am -7pm. Drop Ins are welcome. that is so very cool! We love your blogs…$10 haircut is worth the try now that we know you like it! I think no comment was received by you? I am sorry.